The darkness is closing in and taking Dean with it. There was a lot of blood in this episode, and most of it was at the elder Winchester’s hand. I fear the path he’s on, but I’m looking forward to the finale! As we lead up to the last episode of the season, the plots have taken some decidedly unexpected turns. Cas with his army of angels has now been reduced to a soldier of one, and Dean with the power of the Mark running through his veins has been reduced to a dark version of his former self. I’m not seeing a lot of hope in the end result of this battle, and that scares me. The incident of the angel suicide bombers began to put a spark of suspicion in my head. Here they are, soldiers in Cas’s army, taking out enemy and innocent alike in the name of their leader. Could our favorite angel be behind this? Granted, the past results of Cas being tasked with great power have never ended well. He often becomes overwhelmed by the position and goes crazy or blind to the effect his choices are making in the long-term. However, you’d like to think he’s learned his lesson and that this time would be different. Even though Dean wasn’t so sure about trusting Cas when he denied involvement, I had a feeling it was Metatron’s doing all along. Good to know I was right. One of the suicide bombers turned out to be a friendly face, the reaper Tessa. It was good to see her back, but to hear of her pain and torment over the lost souls screaming out was difficult. When Heaven’s gates closed, all those souls were shut out of their final resting place. They’ve been wandering around, aimless, and unable to reach Heaven as intended. Tessa and the other reapers could hear their agony, but could do nothing about it. Having a purpose, to sacrifice themselves for the mission of getting Heaven back open again, it was worth it in their eyes. Using Dean as an unwilling accomplice, she’s finally free of the torment and can hopefully rest in peace. I will miss her, though her choice plays into something much larger going on. What I didn’t see coming was the choice Cas would have to make and the negative effect that would have on his standing during the final battle. 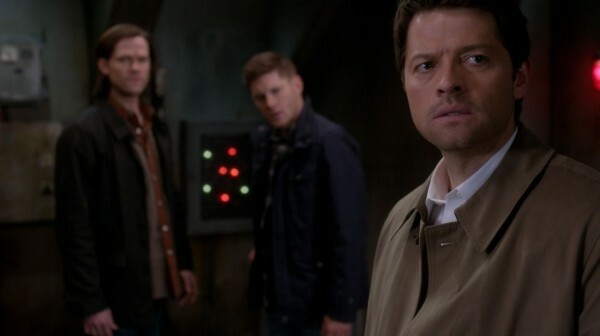 Sure, if you make Cas choose between the Winchesters and anything else, he’s going to choose the Winchesters. But to give him that ultimatum now, when he needs his soldiers most? It’s cruel and sad. But Metatron has shown that he’d use any means necessary to win. Thankfully, his second in command saw the light and decided to switch sides. 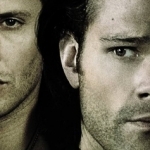 Gadreel has always been an angel that is trying to do what’s right, follow the side of Heaven. Unfortunately, it was very murky to know which side that was. 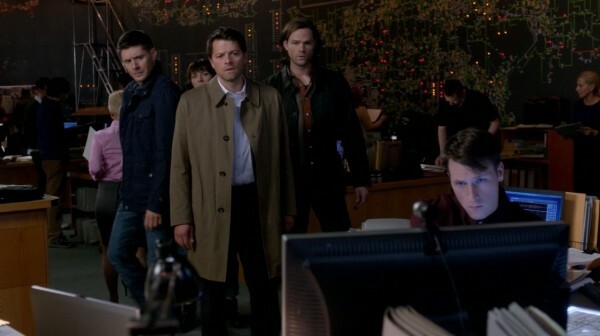 After seeing Metatron doing quite a number of dirty tricks, Gadreel decided to join forces with Cas and the Winchesters. He knew all of Metatron’s secrets, so he was a good asset to have. Too bad Dean ruined all chances of that doing them any good. 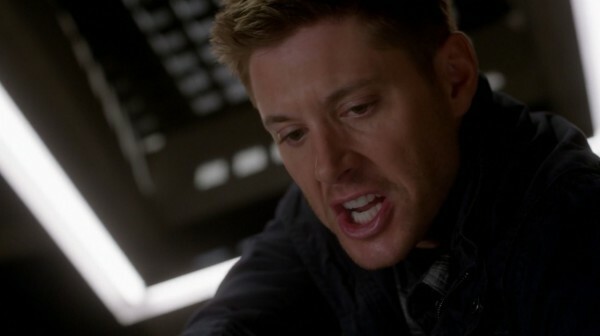 Dean is descending deeper and deeper into the darkness as a result of the Mark of Cain. His thoughts, his actions, are all ruled by the First Blade. You can see that his anger is growing as his patience is decreasing. He will kill at the snap of a finger now, reaching out for the blade even when there’s no need for it. 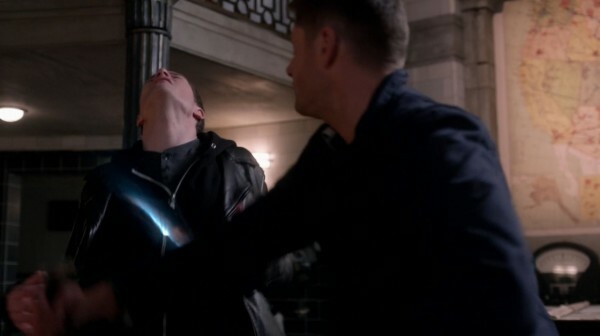 Dean has had a taste of the power and he’s not willing to give it up. Sam got indications that his brother was changing, but I don’t think he or anyone realized just how far it had gone until this episode. 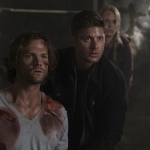 Whereas before Dean was viciously attacking Abaddon, becoming bathed in her blood, there was a purpose to the mission. Yes, he went a bit too far, but the end justified the means. This time around, we have Gadreel coming to the group, offering them a line on Metatron. With his inside knowledge, they could get a leg up and perhaps defeat the powerful angel. But instead of accepting the help, Dean goes right to “kill, kill, kill.” He’s losing himself to the Mark and it’s scary. Where will it end? How will it end? With the finale in a week, I think Dean’s going to a place that no one can fathom and he might be left there for a while.